This spring Ecwid hit a milestone of 1.5 million registered merchants — and we’ve been working hard on delivering the best e-commerce experience to all of you. Don’t have an Ecwid account yet? Sign up for free to start selling on your website, social media, marketplaces and in physical stores. Make sure you never miss our product updates! Subscribe to our newsletter and receive all the information right in your inbox. SEO is a strong tool for driving traffic to your store and is a powerful resource for free promotion. Knowing that we are continuously working on SEO improvements for Ecwid stores. Earlier, we released manual meta-tags and now is the time to update your store links to make them even more SEO friendly as Google reps have recommended. The updated Ecwid URLs are free from extra characters such as #, !, /, and are indexed higher by search engines. People can understand them better now, too. Have a look around our demo store to get the idea of how the new URLs are working. Using HTTPS is becoming the norm and we recommend you to join the safe side too. An SSL certificate is a key for encrypting your data required for using HTTPS on the website — which is a modern standard for keeping your customer data safe. If you sell on Ecwid Starter Site, then you already have an SSL certificate by default. Since the site is essentially a subdomain of Ecwid (mysite.ecwid.com), it uses Ecwid’s SSL. But what if you’ve linked the Starter Site to your domain (so it redirects to mysite.com and not mysite.ecwid.com)? Login to your Ecwid store, go to Settings → Start Page and click on the Change Address button. Click on the Use your domain field and follow the instructions that appear on-screen. If you your Ecwid store is built in a Wix, WordPress, Joomla, Adobe Muse or another website, your customers’ data is safe, too. Since Ecwid handles the payment, all the data is kept and processed on Ecwid’s own servers. This means that all sensitive data processing happens outside your site. Our servers are securely protected by an SSL certificate which keeps your customers’ data safe. We aren’t stopping there. This spring, as a part of this big dashboard renovation, we updated the sales page even more, polished the order editor and refreshed the payments page. And we’re still going. Stay tuned for more updates to your Ecwid Control Panel. In the previous features digest, we introduced the new sales page. It’s a mobile responsive, clean page with new features like mass updates and an order editor. Now, we’ve updated it even more and added useful fields to the order list, based on your feedback. The fields are not mandatory and will not display if they’re left empty. Make sure you’ve enabled new Sales Page in Control Panel → Settings → What’s New. If you want to edit an order, go to your Sales page and click Update order → Edit order. Now the order editor will open in a popup, not in a new window. This way, you can edit your orders more quickly and within fewer actions. Bonus: we improved the loading speed of the order editor so now it’s way faster. 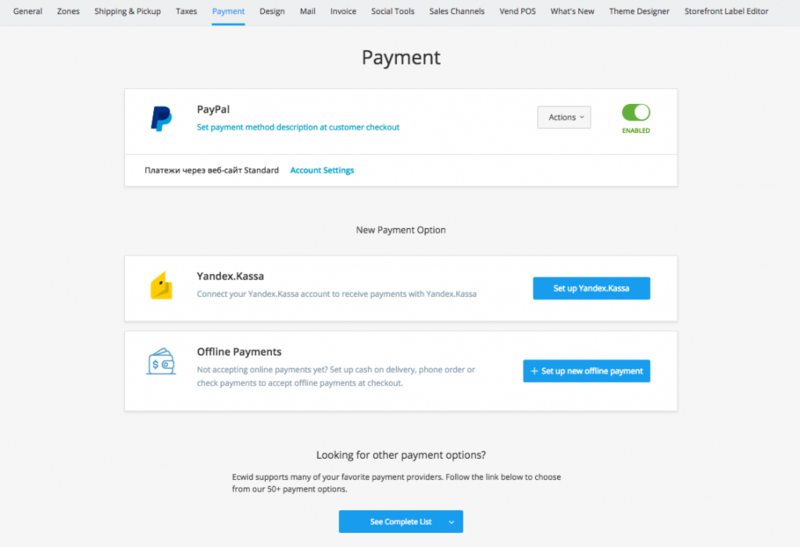 We’ve refreshed the payment settings section so it is a clean, intuitive, and mobile-responsive page. 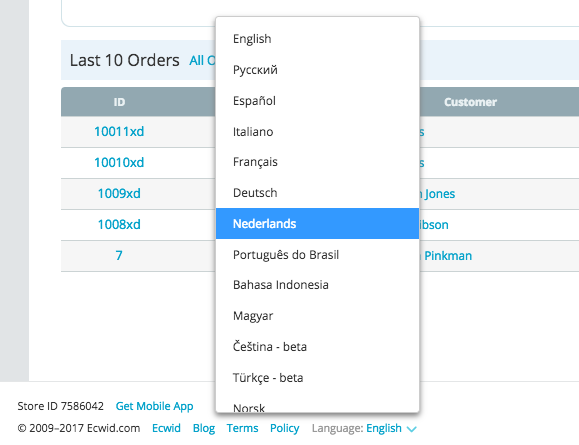 Ecwid merchants from Netherlands can run their stores using their mother language. To enable the translation, click Language in the bottom of your Control Panel and choose Netherlands. As for your Ecwid storefront, it’s been already working in Dutch (and 45+ other languages) — no action required. Accept credit cards online and sell offline with POS — all your orders will sync in real-time. Ecwid and Square let you sell anytime and anywhere. Ecwid and Square have already been powering happy merchants in the US, Canada, and Australia and now work in the UK and Japan too! Updated URLs for SEO and enhanced canonical tags. We launched SEO-friendly URLs to help search engines, as well as people, find your store. The updated URLs are indexed higher by Google and can be browsed easily by customers. Don’t worry, your old URLs will automatically redirect to the updated version, so your customers won’t get lost along the way. You might be thinking, how does Google know which links to index — the old ones or new ones? Faster loading storefront. The plugin now loads much quicker for your visitors and search engines. Stay tuned for all the updates of your Ecwid plugin for WordPress in the changelog. Updated Design Settings: Now you can find all the design settings on one and the same page of your Ecwid dashboard — no need to refer to the Ecwid plugin settings. If you want the colors of your store to automatically match your website theme, you can enable this mode in your Ecwid Control Panel through Settings → Design. Be sure to read our comprehensive guide on changing your Ecwid store design, too. If you sell online with Ecwid on Weebly, it’s now easier than ever to enable Color Adaptive Mode. No need to enable it separately in the application, just go to Ecwid Control Panel → Settings → Design, click Enable Color Adaptive Mode and the colors of your store will automatically match the color theme of your website. Kliken Marketing: advertise on Facebook and hundreds of other top websites. Ecwid App Market now counts 100+ apps for extending Ecwid store’s functionalities, available for Ecwid merchants on paid plans. More API details and reference links are available in our changelog.